Ester Awo Bartey and her grandson, Kofi Abbey talk about LEAP (Livelihood Empowerment Against Poverty) and how it has benefited her families lives, in Abokobi Village on October 12, 2015. 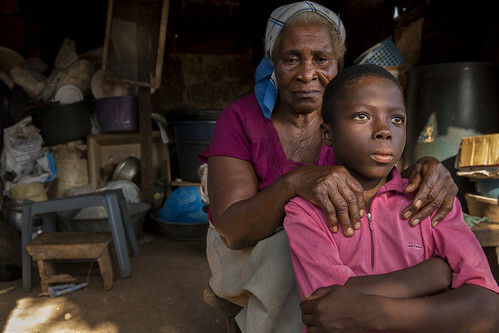 Esther Awo Bortey was left to care for her 10-year-old grandson, Kofi, and her 15-year-old granddaughter, Gloria, after their parents abandoned them in Abokobi, Ghana. Pain in her legs severely limit Esther’s mobility. Even walking short distances is a real challenge. Her only stable income is the 64 Ghanaian cedi ($17) that she receives every two months through a World Bank Group-sponsored cash-transfer program. She uses assistance from the Livelihood Empowerment against Poverty (LEAP) program to provide food and school supplies for her grandchildren. Esther and Kofi are among the 1.1 billion who lack access to electricity and the hundreds of millions of people who live on less than $1.90 per day.